Beneath the surface of the wonderful technique and beautiful pastel colors of Jen Dwyer's recent exhibition, "Not For You, Bunny," at Lucas Lucas Gallery lies a deeper exploration of gender roles, social class structures, and individual autonomy. Dwyer stood elegant and tall in a dark green floral jumpsuit while she openly discussed her initial motivation to create her ceramic installations. Following the election of Donald Trump, her graduate study shifted from environmental science to examining contemporary gender politics through art. She strives to "question and subvert hierarchies through both humor and vulnerability." 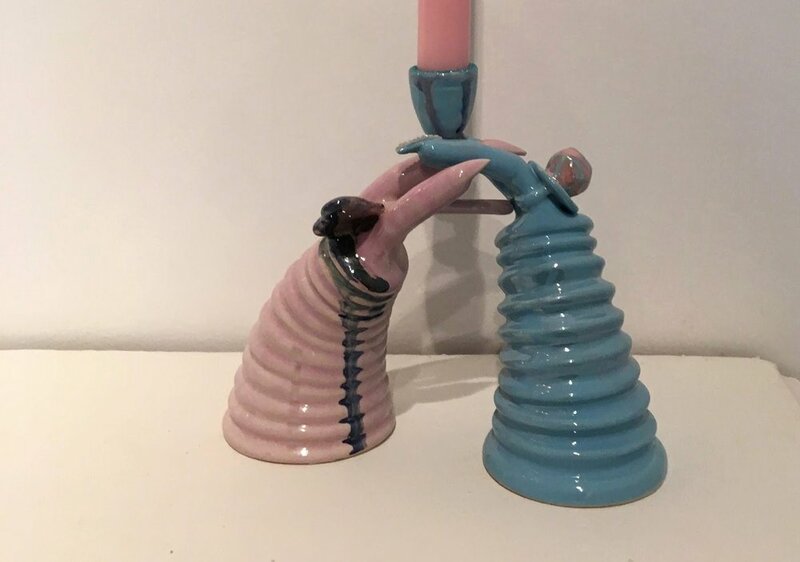 Dwyer described her recent work as fanciful, intricate porcelain mirror frames, candelabras and miscellaneous vessels that merge iconology from antiquity, rococo, pop, surrealism and the uncanny, infused with contemporary feminist themes. The artist recognizes that in this society, women’s associations with power are limited. She hopes to "broaden them by gathering imagery across cultural lines and histories that explore the subjugation of the female body and create decorative, quasi-functional sculptures that offer a remixed interpretation of utopia." A detail of her work that may go unnoticed at first glance are the long nails that extend from the fingers of various ceramic pieces. These features signify a subtle attempt at defending herself from the unjust society around her, and an independent act in defiance of social disparity. One aspect of her work is the investigation of the human desire to withdraw from reality. "Throughout history, people have turned to decadence: objects of comfort, activities of pleasure and consumption, to deny and escape their inevitable fate, death," Dwyer explains. She is not only interested in interpreting objects of delight and materialism, but also aspires to create a utopia-like atmosphere. As she reflected on her own life as a source of inspiration, Dwyer stated, she had been thinking back to her childhood recently in her work. Having turned 30 a few months ago, the artist found herself contemplating the concept of adulthood and what defines the transition from childhood to adulthood, themes which are both reflected in her creative expression. The uncertainty of when childhood ends and adulthood begins can be quite confusing, and for some, the question may never be answered. Dwyer commented that she definitely had felt a strong sense of nostalgia recently. "I've been thinking about this strong sense of my nostalgia I have for my childhood that plays a role in this dreamlike world I'm interested in creating in my work," Dwyer explains. "A kind of an illusion: a safe, playful and soft space that only exists in a fantasy. Kind of like memories, I find that we often usually remember the good stuff, and quickly forget the bad." When an artist creates artwork that turns viewers into participants of their own imagination, it immerses the public in the artist's mind, creating an immeasurable impact. "On a more personal level, art is certainly a tool for coping with all my overwhelming emotions. There are few things I love more than sculpting in the studio with friends and studiomates," Dwyer stated. "I haven't shown my gilded mirror pieces to a wide audience yet so I'm excited to see how the viewers will interact with them and see how my audience’s bodies become a part of the piece, and essentially finish the piece." While women continue to experience suppression in today's political climate, speaking with Jen Dwyer and hearing her describe her art was a breath of fresh air. The artist's enchanting pieces of art echo her feminist views of gender and societal roles, and simultaneously serve as a call for equality. Dwyer told Blended that she has several things planned for the next coming months, many of which are NYC-based, so you can expect to hear more on the talented artist in the very near future.